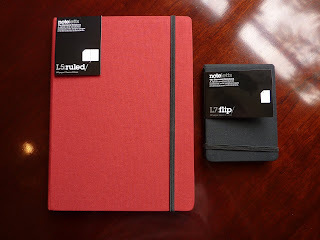 Filofax USA very generously sent me two samples of their new Noteletts notebooks to review. 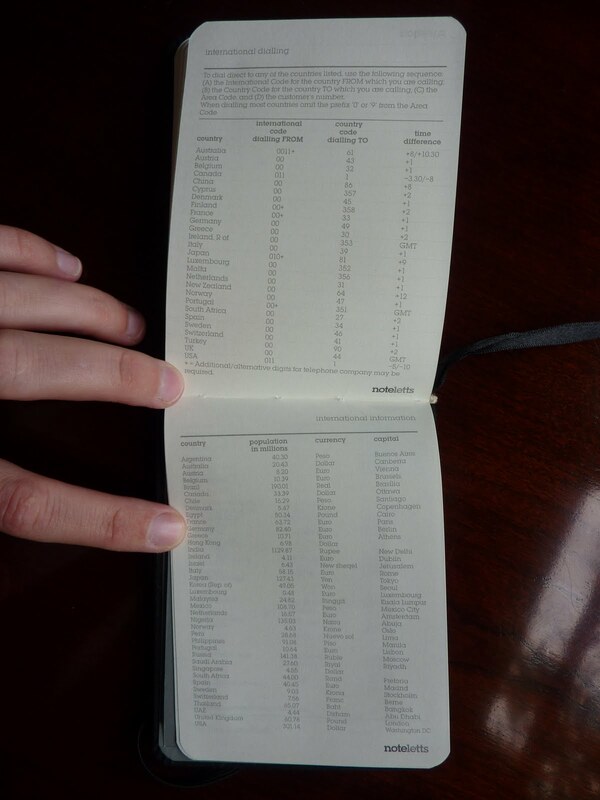 Thank you Filofax USA! These are excellent notebooks and I'm VERY happy to have them, and excited to tell you all about them too. Noteletts are the new line of notebooks from Letts of London, who make excellent planners/ diaries and who also owns Filofax. You can find Letts online at www.lettsusa.com and at www.letts.co.uk. I received the L5 Ruled, which measures approximately 6 3/4 by 9 inches, and the pocket size L7 Flip which measures almost 3 1/2 inches by 4 1/2. I was immediately excited when I received these notebooks in the mail. These are really cool! Unfortunately I didn't get any photos of them with the wrapper still on because I ripped it off immediately. 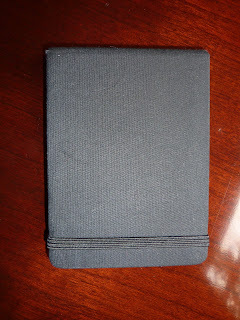 Also you don't get to see the pocket size reporter notebook in its pristine condition, because these arrived the day before I went to Croatia and I instantly tossed this little black book in my bag as my travel notebook. So, you see it in its slightly scuffed post-travel condition. These notebooks have several features which make them immediately stand out from the notebook crowd. Their hard covers are fabric-covered, which look and feel very nice. Noteletts have something I've never seen in a notebook before: international information pages like what you often see in planners/ diaries. 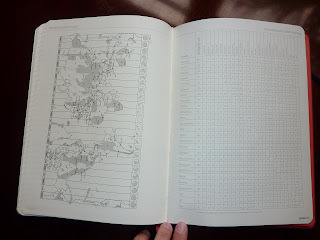 They have info like international dialing codes, time zones maps, and more. Each notebook has an undated annual planner in the back to record plans for every month of the year, so you could use this as combination notebook/ planner. I'm really excited about the monthly planners because you can use them to track goals, write future appointments, keep your birthdays/ anniversaries, etc. There's an actual ribbon, not cotton, placemarker that is color-matched to the cover. Every page has a place in the top right corner to note the date you make your entry (click on photo to enlarge). The paper is absolutely glorious. I mean, wow. Super-smooth, thick, cream colored. According to the company it is 100 gsm. Unfortunately I don't use fountain pens so I can't speak to its FP performace, but my Pilot V5 and Sakura Micron 05 pens just glide across the page with no feathering, very little shadow on the other side of the page and no bleed-through whatsoever. I can't stop touching this paper! This is paper you WANT to write on. 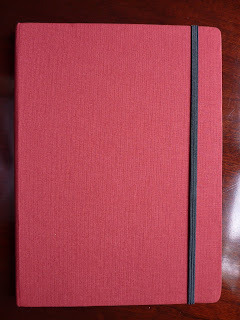 The first thing I thought of for these notebooks of course is that they'd be perfect as a travel journal (and thus the book went immediately into my bag). With the international information and date space on each page, these notebooks would be perfect to plan and record any trip. The hard cover and elastic strap make the book perfect for traveling around in your bag without getting beat up or flapping open. These notebooks would also be perfect for work. They are so classy-looking you'll be proud to use them in meetings. 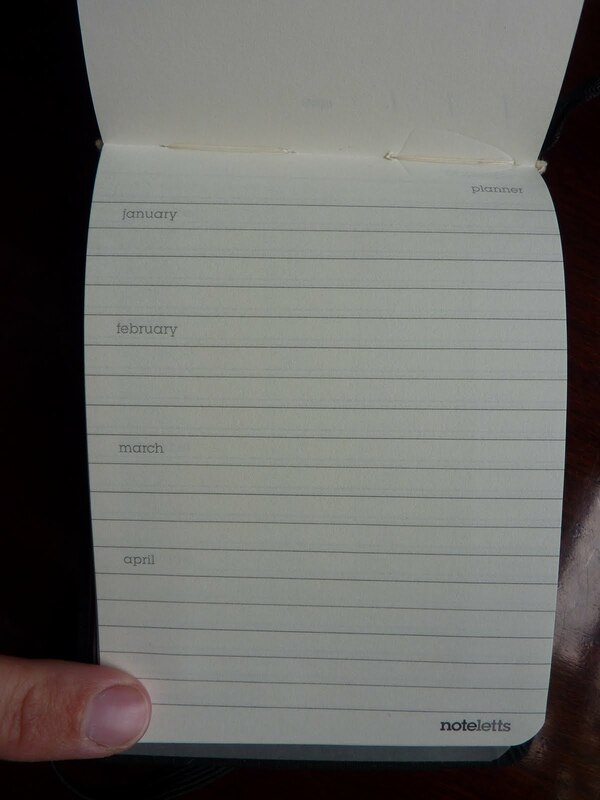 The date space at the top of each page will help keep your notes organized each day. 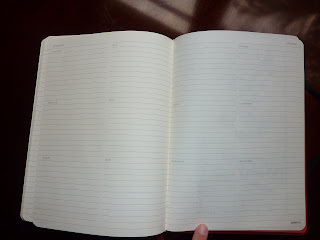 And the annual planner in the back will help you keep track of multiple projects at once. Noteletts are available in the small L7 flip book I reviewed here, small L7 notebook, medium L6 notebook, and large L5 notebook I have reviewed here. They come with blank, ruled or quadruled pages. 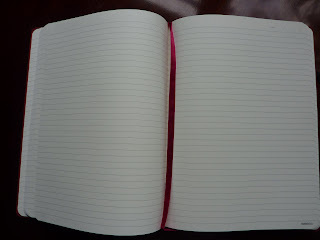 The colors available are Burgundy (the color of the large notebook I reviewed here), Black, Lilac, Green and Pale Blue. 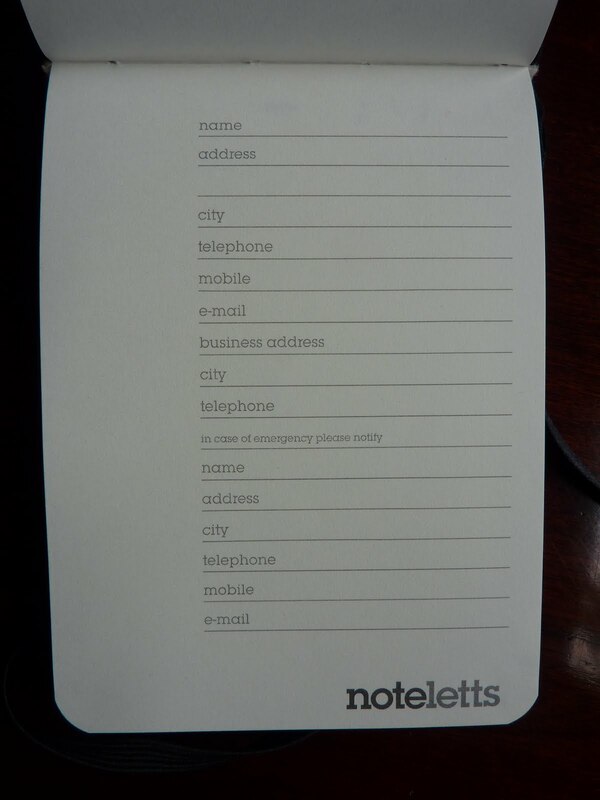 UK folks can buy Noteletts on the Letts UK site as well as various retailers. Click here for the Noteletts UK website. Many thanks again to Filofax USA for letting me sample these excellent notebooks! I'm officially hooked! Nice! 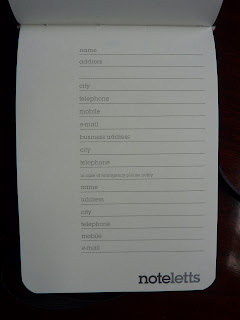 So, are these Lett's version of a Moleskine? 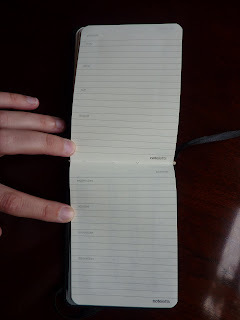 How do you think the larger one would compare to a Mole daily planner for a journal? Ooh, a comparison! 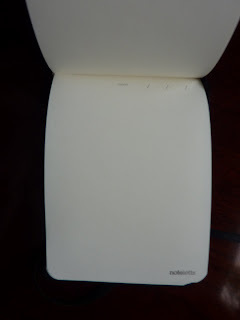 I'll try to resist writing a thesis on the comparative anatomy of Noteletts vs Moleskine and just answer your question. 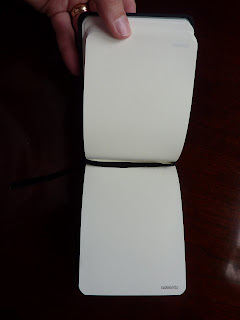 The large Noteletts is bigger than the large Moleskine: It's about an inch and a half wider and almost an inch taller. So if you like a bigger page to do lots of writing and really stretch out your thoughts, you'll like the large Noteletts. If you tend to write more (or less) than a page for each day, you may prefer the undated book so that you can assign dates to each page. 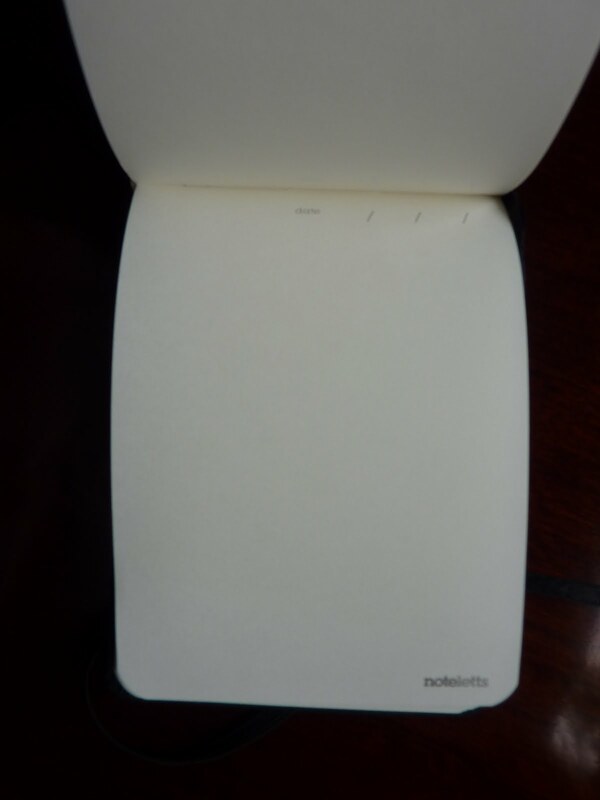 The Noteletts paper is thicker and smoother than Moleskine's. 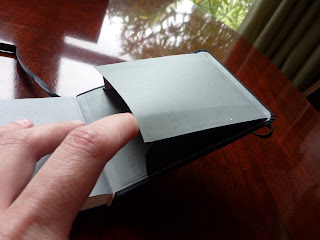 With the nicer paper, fabric-covered covers, ribbon placemarker, nicer paper, international info pages and yearly planner, I would have to say the Noteletts notebooks are a step or three up from Moleskine. Someone took pity on us writers to fountain pen! Do you know how many pages are in the large Notelets? Is it 240 like the Moleskine, or 192, or some other number? I was just about to ask the same question about the number of pages. I feel intrigued now, the fabic cover is somehting that I would really like. Yes, sorry about that, I should have specified: both the small and large have 192 pages. Thanks. 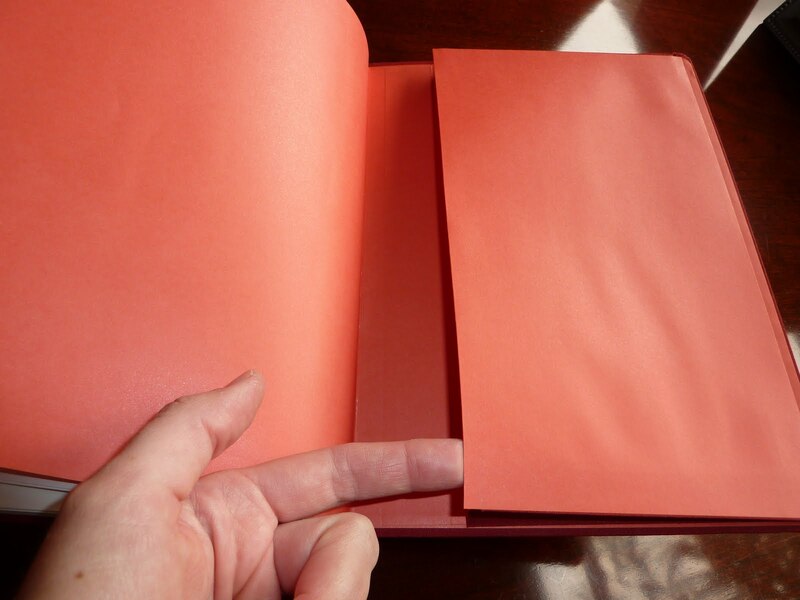 When I looked closer at the first image, I could see the number of pages as well as the exact dimensions. I really like the looks of these, especially the fabric cover, which gives it a sort or retro chic. I was also interested in the number of lines on the larger one. I counted something like 33, which makes me wonder if they aren't too narrow. I like narrow lines and have fairly small handwriting, but I worry that these lines are too narrow even for me. 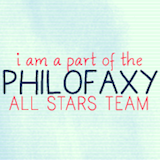 Can you give some idea of the line spacing? I measured the line spacing in the Large Noteletts at 6mm, which is almost 1/8 of an inch. 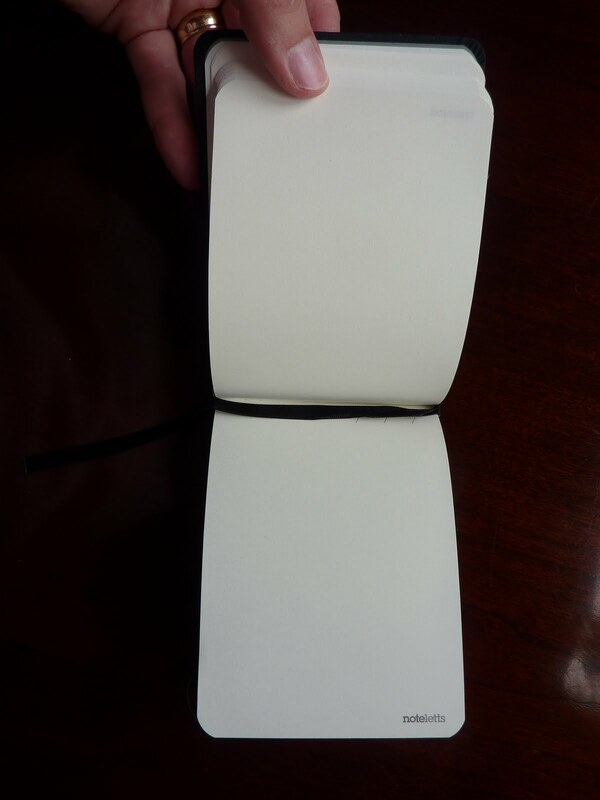 If you are familiar with the line spacing in a large Moleskine notebook, it is exactly the same. There are 34 lines per page, not counting the top and bottom margins. Thanks, and thanks for the great review. These look and sound really nice. I may have to add a couple to my stash. Laurie--off topic--but I purchased a little moleskine--the little pocket weekly notebook that starts in July! It is so cute. Anyway there are a couple of "timetable" pages that are a mystery to me. Would they be for recurring appointments or a class schedule? Have you any ideas? Yes the Timetable pages in the 18 month Moleskine planners are meant to be used for your class schedule. There are two 2-page spreads of the Timetables, one for the fall semester and one for the spring semester. For non-students, these Timetable pages are a great place to map out your recurring events for each week, whether it's your staff meetings every Monday morning or your daughter's ballet classes on Tuesdays and Thursdays. Thanks Laurie for the confirmation of the pages. I just checked them out on Amazon and I am close to hitting the CheckOut Button.